LOS ANGELES, CA: Julian Construction Inc. (julianconstruction.com/), a foundation repair and construction as well as general contractor company, is speaking out on the long and short term effects of foundation damage on a structure. Safety inspection expert Shawn Kyles described some of the common causes of foundation damage, as well as the importance of repairing the damage before more serious problems develop. Mr. Kyles has inspected over 15,000 structures in the course of his work in the construction business. Mr. Kyles stated: “Homes are built on foundations that support the building’s structure. When a foundation is damaged, the entire house is often affected. Foundation problems can be divided into two categories; existing damage that needs to be addressed, and issues that can eventually lead to foundation trouble.” The full text of his statement, regarding the causes of and long-term effects of foundation damage, can be read here. Julian Construction owns its own company and is built on a “no middlemen” model – no salesmen, no subcontractors. When you work with Julian Construction you get the principals of the company and workers of Julian Construction under your home. The result is the highest quality work at affordable prices. 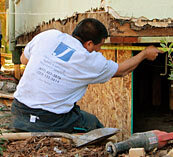 They can be contacted by phone at 323 733-3377, by fax at 323 733-4477 or via their website, www.julianconstruction.com. You can see tips and advice about home foundations on their blog here.